About the Centre — UTech, Ja. 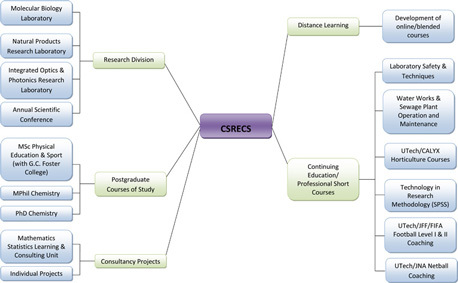 Welcome to the Centre for Science-based Research, Entrepreneurship and Continuing Studies (CSRECS) website. The Centre is a unique entity at the University of Technology, Jamaica that provides a management framework within the Faculty of Science and Sport to consolidate the activities involved in the promotion of research, consultancy and continuing education in the pure and applied sciences. We provide support for all research projects, postgraduate and continuing education courses in the faculty and we are continuously developing new courses in the areas of Science and Sport to fulfil the training needs of an ever-changing society. We also facilitate the enrolment of professionals or individuals who wish to undertake selected courses offered by the Faculty as “occasional” or “specially-admitted” students. Please contact us if you need more information about the research laboratories and programmes in the Faculty of Science and Sport.